Not too long ago I talked about how authors like Neil Gaiman move the genre away from the D &D style stigma that it is sometimes known for. While this is indeed true I don’t want people to think that the books happy to relish in the deep and rich archetypical fantasy lore are not worth reading and are just a cliché to be dismissed, this is not the case. One of my favourite authors who make this point very clear is R.A. Salvatore; his works do not shy away from D &D realm of dragons and dragon fighters, elves and dwarves, Salvatore’s books are steeped in it. 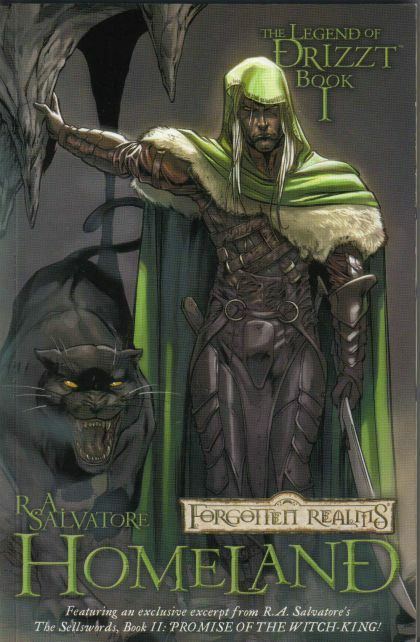 Salvatore’s best known and most popular works follow the life of Drizzt Do’urden; a renegade Drow elf who left the underground city of his birth to seek solace on the surface. The Legend of Drizzt series spans over a dozen novels but the saga begins in the book ‘Homeland’ the first part of the trilogy which serves as the prequel to the initial ‘Icewind dale’ trilogy. The book details Drizzt’s birth and how he came to be the hero he is today. Drizzt Do’Urden is precisely what one would expect a Drow elf not to be, he is not vicious, cruel or power mad. Instead Drizzt’s ideals closer match honour and love. It is this contrast of ideas that leads him to rebel against the society into which he is born, this leads to uproar within his own family and in turn the entire city. So partnered with his magical panther companion Drizzt leaves Menzoberranzan to make for the surface thus beginning his tale. While Salvatore does not break new ground with his writings, he really isn’t trying to do so, what Salvatore does is create his own rich and deep corner of the already massive ‘Forgotten Realms’ world and populates it with characters that while often fall into the stereo types associated with the genre this doesn’t stop them from being characters that the reader can connect to. The real highlight of Salvatore’s narrative is the way in which he choreographs battle scenes, Salvatore is a master in this department painting scenes that are exciting to read and brilliant to behold. So while I praise authors who take fantasy to new and modern places this does not mean that there is no place on my book shelf for Drizzt and his companions.